Straight out of the box, the weight of the 178mm long rubber-handled high-grade steel handle becomes apparent - this was promising. 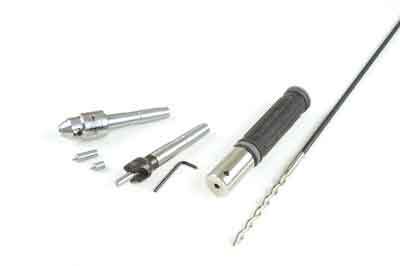 The boring bar is essentially a custom-made Austrian HSS-M2 steel, 8mm parabolic fluted drill bit, which tapers to 7.9mm where it is fixed to the 6.5mm steel bar. This gives it a very useful 880mm overall length. Being a tool junkie, I also purchased the matching 25mm counterbore drive and the system's hollow revolving centre, which comes with two removable points in two sizes and three chip ejection ports. I decided to test this system against a standard and also new shell auger, side by side, on the same piece of end grain oak (Quercus robur), at 1,000rpm. The cam lock handle is simple in use, works well and eliminates the prospect of touching the counterbore by simply marking the shaft and sliding the handle as a depth stop. The rubber feels almost sticky and comfortable and I did think I would like to be able to apply more pressure for speed purposes, if I had several lamps to make. This was unnecessary as the cutting speed, when equal force was applied to both tools, ensured that the revolution was at least twice as fast as the shell auger and cut a good straight hole. It was very impressive in this respect and actually does not need to be forced, even on hard oak. The ejection ports on the hollow centre work well, ejecting the chips efficiently. 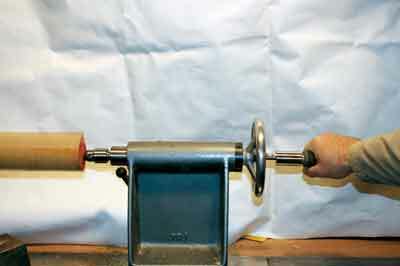 After use, the tailstock still needs some air to blow out the remaining swarf, but no system will eliminate this. I did try this with a standard hollow centre and it proved a much, much slower process overall and not very efficient as there was too much swarf left inside the tailstock. So the evolution hollow centre is, in my view, a necessary purchase. The counterbore worked well, but even I resisted buying the additional cutting head as the old trick of using the counterbore itself to cut a mortise worked fine for me, although this is probably a slower option. Axminster has made a very impressive hollowing system - the quality of the steel overall is high. It should last any turner a very long time. If you have a run of lamps to make, then this will save a considerable amount of production time. Axminster should, though, in my opinion, have included the matching hollow centre as part of the kit as I do feel it is needed to get the full benefit of this system. The boring bar and handle kit, the hollow centre and the counterbore may be a little expensive for some, but the quality in use really does shine through.